Not all snakes bite, and not all snakes that bite are poisonous. Poisonous snakes inject venom into their victims using modified salivary glands. There are different types of toxins that may be present in a snakebite including cytotoxins that cause local tissue damage, hemotoxins that cause internal bleeding, neurotoxins that affect the nervous system, and cardiotoxins act directly on the heart. Snakebite symptoms vary widely depending on the type of snake and the toxin in the venom. Symptoms of snakebites may range from simple puncture wounds to life-threatening illness and death. Localized symptoms of snakebites include painful and tender areas of the skin and tissue around the bite. Bleeding may occur from the bite site or from the mouth, old wounds, or from internal organs. 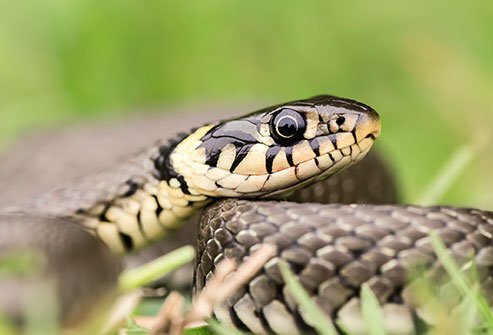 Some poisonous snakebite symptoms can cause vision problems, speaking and breathing trouble, and numbness close to or distant to the bite site. There may be muscle death, which can lead to kidney failure. Some poisonous snakebites lead can paralyze the breathing muscles and lead to death. Bites by venomous snakes result in a wide range of effects. They range from simple puncture wounds to life-threatening illness and death. The findings following a venomous snakebite can be misleading. A victim can have no initial significant symptoms, and then suddenly develop breathing difficulty and go into shock. Local effects: These are the effects on the local skin and tissue surrounding the bite area. Bites by vipers and some cobras (Naja and other genera) are painful and tender. They can be severely swollen and can bleed and blister. Some cobra venoms can also kill the tissue around the site of the bite. Bleeding: Bites by vipers and some Australian elapids can cause changes in the victim's hematologic system causing bleeding. this bleeding can be localized or diffuse. Internal organs can be involved. A victim may bleed from the bite site or bleed spontaneously from the mouth or old wounds. Unchecked bleeding can cause shock or even death. Nervous system effects: The effect on the nervous system can be experienced locally close to the bite area or affect the nervous system directly. Venom from elapids and sea snakes can affect the nervous system directly. Cobra (Naja and other genera) and mamba (Dendroaspis) venom can act particularly quickly by stopping the breathing muscles, resulting in death without treatment. Initially, victims may have vision problems, speaking and breathing trouble, and numbness close to or distant to the bite site. Muscle death: Venom from Russell's vipers (Daboia russellii), sea snakes, and some Australian elapids can directly cause muscle death in multiple areas of the body. There can be local effect of muscle death (necrosis), or distant muscle involvement (rhabdomyolysis). The debris from dead muscle cells can clog the kidneys, which try to filter out the proteins. This can lead to kidney failure. Spitting cobra bite. Many elapid bites result in little local swelling, but the spitting cobras are known for the amount of swelling and tissue damage they can cause. Western diamondback rattlesnake (Crotalus atrox) bite. Rattlesnake bites can cause severe swelling, pain, and permanent tissue damage. Copperhead (Agkistrodon contortrix) bite. These bites usually result in local pain and swelling but usually have less tissue loss than rattlesnake bites. Timber rattlesnake (Crotalus horridus) bite. Pit viper bites can cause a leakage of blood cells out of the blood vessels, even on parts of the body away from the bite site. Note the significant bruising of the upper forearm and arm. For thousands of years, snakes have been associated with evil. They slither, hiss, and stare with unblinking eyes. One even deceived Adam and Eve in the Garden of Eden. So, it’s no wonder many people have a fear of snakes, which is called herpetophobia. But are your snake fears justified? Every year in the United States, venomous snakes bite about 8,000 people. This is more common between April and October when more people are outside and active. But out of all those snakebites, 30 years of data show that no more than 12 people have died from snakebites in any single year. While deaths from snakebite are extremely rare, snakebites do happen, and every one of them should be considered a potentially life-threatening emergency. In this slideshow, discover what snakes to watch out for, what you can do to prevent snakebites, why snake venom works the way it does, and what to do if you are bitten.